Morgue - "Barbed Wire Cranium"
Wow... this French Grindcore outfit makes some damn intense music. Some cool sounding and complex guitars combined with totally over the top drumming and super raw production, makes for a intense mental onslaught. Probably a massive headache for some people! I highly suggest you blow your brains out with this 4 song 13 minute EP of intense music. 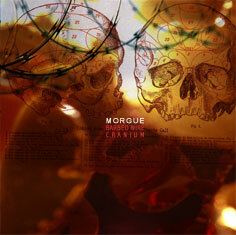 For more information you can visit the Morgue web site at: http://www.morgue.fr.st.